WASHINGTON The Agriculture Department says three California poultry processing facilities linked to a salmonella outbreak in raw chicken can stay open, for now. In a statement Thursday, the USDA said Foster Farms, which owns the facilities in Fresno and Livingston, Calif., has made "immediate substantive changes to their slaughter and processing to allow for continued operations." The department threatened earlier this week to shut down the plants if Foster Farms did not prove that it had made enough changes. Sampling by the USDA in September showed that raw chicken processed by those facilities included strains of salmonella that were linked to the outbreak that has sickened 278 people in 17 states. 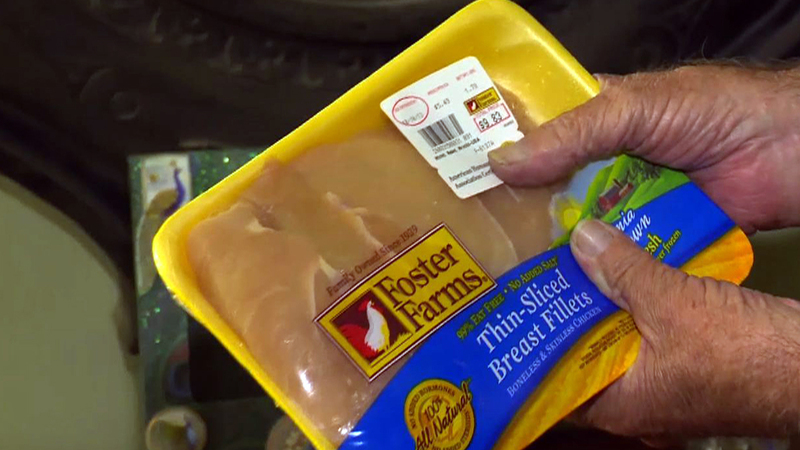 The USDA said government inspectors will monitor the company's improvements and "continue intensified sampling" of Foster Farms meat for the next three months. In a Monday letter to Foster Farms, the USDA said the positive samples coupled with the illnesses suggest that the sanitary conditions at the facility "could pose a serious ongoing threat to public health." The company had until Thursday to respond. The outbreak, which has been going on since March, has had a high rate of hospitalizations. The Centers for Disease Control and Prevention said 42 percent of victims were hospitalized, about double the normal rate, and it is resistant to many antibiotics, making it more dangerous. In a statement Thursday, Foster Farms President Ron Foster said the company has been working for two months to add increased food safety controls. "This officially validates our progress, but we are not stopping here," Foster said of the company's agreement with the USDA to keep the plants open. The CDC says the outbreak is ongoing and some illnesses began as recently as two weeks ago. The majority of illnesses have been in California, but people in 17 states have been infected, from Texas to Michigan to North Carolina. Even though the meat hasn't been recalled, some grocery stores are taking it off their shelves anyway. Kroger Co. said it is taking some Foster Farms products from the shelves in certain stores and calling customers who it knows may have purchased the products. The company owns several chains, including Ralph's, Fred Meyer, Fry's and others. Consumer advocates have for several years petitioned the department to change the way salmonella outbreaks in meat are handled. Because salmonella is so prevalent in poultry and is killed if consumers handle and cook it properly, the government has not declared it to be an "adulterant," or illegal, in meat, as is E. coli. Outbreaks of salmonella in poultry can take longer to discover and recalls don't happen as quickly. If the outbreak had been E. coli, or if the salmonella had been found in food that wasn't meat, then the government would have had more authority to force a recall. That's because USDA, which oversees meat safety, classifies most of the main types of E. coli as illegal. The Food and Drug Administration oversees the safety of most other food and doesn't distinguish pathogens in foods - salmonella is treated as seriously as any other contaminant. With the evidence they have, withdrawing meat inspectors and shutting down the plant would have been the best regulatory recourse the agency had, officials said. If USDA had decided to force a recall, it would most likely have had to go through the courts. The partial federal government shutdown has also been hampering the government response to food safety issues. While USDA's meat inspectors are on the job, the CDC had furloughed many of those who work to investigate outbreaks. But the CDC recalled many of those workers Tuesday to work on the salmonella outbreak.